A primary part of being human is the ability to use our hands in extraordinary ways. This effective and skillful hand use requires stable and painless movement of all upper extremity joints, including the elbows. Since the elbow bends and straightens much like a basic door hinge, it is referred to as a hinge joint (Image 1). However, the interaction of the elbow with the forearm and wrist is far from basic. When this complex interaction is fully understood, it’s easy to see how dysfunctional elbow mechanics could be a major contributor to forearm and hand pain. 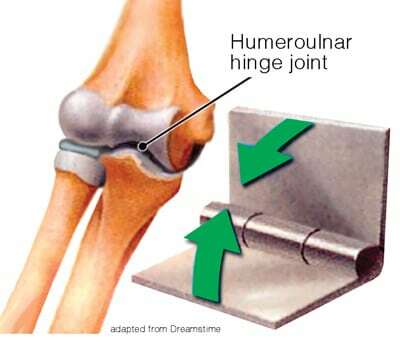 Image 1: The humeroulnar is the only true elbow hinge joint. While the humeral and ulnar bones flex and extend similar to a door hinge, the humeral and radial articulations are much morecomplex. Shaped like a contoured knob with a cup at the end, the elbow’s radial head smoothly rotates around the ulnar bone, causing the radiohumeral and radioulnar joints to efficiently turn the palm up (supination) or down (pronation) (Image 2). Sports—and occupations that involve repetitive lifting, forceful forearm maneuvers, and recurrent vibration—may, in time, damage the elbow’s extensor tendons and degrade the joint’s articular cartilage. In the presence of altered joint mechanics, the brain may decide to layer the area with protective spasm, resulting in radial nerve symptoms that resemble lateral epicondylalgia, or tennis elbow. Famed hand surgeon Emanuel Kaplan, MD, was the first to suspect radial nerve denervation as a possible cause for some epicondylalgia cases. In dissection studies, he noted constriction of the radial nerve by adhesions to the capsule of the radiohumeral joint and the short extensor muscle of the wrist1A study published in Manual Therapy Journal found that a significant percentage of double-blind subjects presenting with tennis elbow demonstrated a favorable response to articular stretching techniques to restore optimal extension, pronation, and supination.2 A similar study on computer users found immediate reduction in lateral elbow pain after radial nerve mobilization.3 The researchers concluded that mobilization with movement appears to be a promising alternative treatment forclients with tennis elbow. But why? Most of us who treat athletes are keenly aware that repetitive gripping can strain elbow tendons, leading to palpable maladaptions in tendon structure. During clinical examination of tennis elbow, clients often report tenderness over the common forearm extensor tendon insertion at the lateral epicondyle. Pain is reproduced with resisted wrist and middle finger extension and with gripping activities. I’ve had some success treating tendinopathiesby working the tissues above and below the injury site and then teaching specific eccentric strengthening exercises. In the past few years, I’ve added articular stretching and neural mobilization techniquesto calm hyper excited mechanoreceptors, reduce protective muscle guarding, and remove tension on strained fibers and compressed nerve tunnels. Try incorporating the myoskeletal articular stretching techniques such as the ones shown in Images 3, 4, and 5 prior to assessing and treating soft-tissue lesions.If your state laws allow home retraining advice, teach the radial nerve mobilization stretch shown in Image 6. You may find that many chronic elbow and forearm problems soon disappear as full mobility is restored to motion-restricted joints and associated soft tissues. Image 3: With the elbow pinned to the client’s side, the forearm is rotated to the first supination barrier. The client gently pronates the arm against resistance to a count of five and relaxes. I supinate to the next restrictive barrier and repeat until full supination is reached. Image 4: The forearm is rotated to the first pronation barrier and the client gently supinates against resistance to a count of five and relaxes. I rotate to the next restrictive barrier and repeat until full pronation is achieved. Image 5: The client’s elbow is extended to the first restrictive barrier. The client gently flexes the biceps to a count of five and relaxes, and I bring her elbow to the first extension restriction barrier. Repeat until full elbow extension is achieved. Image 6: The client extends the elbow and curls the fingers around the thumb. She internally rotates the arm, retracts the scapula, and left sidebends her head. To enhance the nerve flossing stretch, she slowly abducts her arm and reaches toward the floor. Repeat daily. Adapted from Dreamstime. 1. E. B. Kaplan, “Treatment of Tennis Elbow by Denervation,” Journal of Bone and Joint Surgery: American Volume 41, no. A(1) (January 1959): 147–51. 2. J. H. Abbott, C. E. Patla, and R. H. Jensen, “The Initial Effects of an Elbow Mobilization with Movement Technique on Grip Strength in Subjects with Lateral Epicondylalgia,” Manual Therapy 6, no. 3 (August 2001): 163–69. 3. 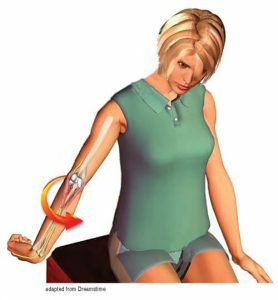 V. Arumugam, S. Selvam, and J. C. MacDermid, “Radial Nerve Mobilization Reduces Lateral Elbow Pain and Provides Short-Term Relief in Computer Users,” Open Orthopaedics Journal 8 (October 2014): 368–71.